Satsuki Ina was born behind barbed wire in a prison camp during World War II, the daughter of U.S. citizens forced from their home without due process and locked up for years following Japan's attack on Pearl Harbor. Roughly 120,000 Japanese immigrants and Japanese-Americans were sent to desolate camps that dotted the West because the government claimed they might plot against the U.S. Thousands were elderly, disabled, children or infants too young to know the meaning of treason. Two-thirds were citizens. And now, as survivors commemorate the 75th anniversary of the executive order that authorized their incarceration, they're also speaking out to make sure that what happened to them doesn't happen to Muslims, Latinos or other groups. They're alarmed by recent executive orders from President Donald Trump that limit travel and single out immigrants. In January, Trump banned travelers from seven majority Muslim nations from entering the U.S., saying he wanted to thwart potential attackers from slipping into the country. A federal court halted the ban. Trump said at a news conference Thursday that he would issue a replacement order next week. "We know what it sounds like. We know what the mood of the country can be. We know a president who is going to see people in a way that could victimize us," said Ina, a 72-year-old psychotherapist who lives in Oakland, California. President Franklin D. Roosevelt signed Executive Order 9066 on February 19, 1942, to protect against espionage and sabotage. Notices appeared ordering people of Japanese descent to report to civil stations for transport. Desperate families sold off belongings for cheap and packed what they could. The luckier ones had white friends who agreed to care for houses, farms and businesses in their absence. "Others who couldn't pay their mortgage, couldn't pay their bills, they lost everything. So they had to pretty much start from scratch," said Rosalyn Tonai, 56, executive director of the National Japanese American Historical Society in San Francisco. Tonai was shocked to learn in middle school that the U.S. government had incarcerated her mother, aunts and grandparents. Her family hadn't talked about it. Her mother, a teenager at the time, said she didn't remember details. Her organization, the Japanese American Citizens League and others oppose the use of the word "internment." They say the government used euphemisms such as "internment," ''evacuation," and "non-alien" to hide the fact that U.S. citizens were incarcerated and the Constitution violated. The groups say this White House has what they see as the same dangerous and flippant attitude toward the Constitution. Japanese-American lawmakers expressed horror when a Donald Trump supporter cited the camps as precedent for a Muslim registry. The Japanese American Citizens League "vehemently" objected to executive orders signed by Trump last month, to build a wall along the Mexican border, punish "sanctuary" cities that protect people living in the country illegally, and limit refugees and immigrants from entering the country. "Although the threat of terrorism is real, we must learn from our history and not allow our fears to overwhelm our values," the statement read in part. Hiroshi Kashiwagi was 19 when his family was ordered from their home in Northern California's Placer County and to a temporary detention center. He remembers slaughtering his prized chickens— New Hampshire Reds— for his mother to cook with soy sauce and sugar. She stored the bottled birds in sturdy sacks to take on the trip. The family ate the chickens at night to supplement meals. The birds didn't last long. Today, Kashiwagi, 94, is a poet and writer in San Francisco who speaks to the public about life at Tule Lake, a maximum security camp near the Oregon border. Winters were cold, the summers hot. They were helpless against dust storms that seeped inside. "I feel obligated to speak out, although it's not a favorite subject," he said. "Who knows what can happen? The way this president is, he does not go by the rules. I'm hoping that he would be impeached." 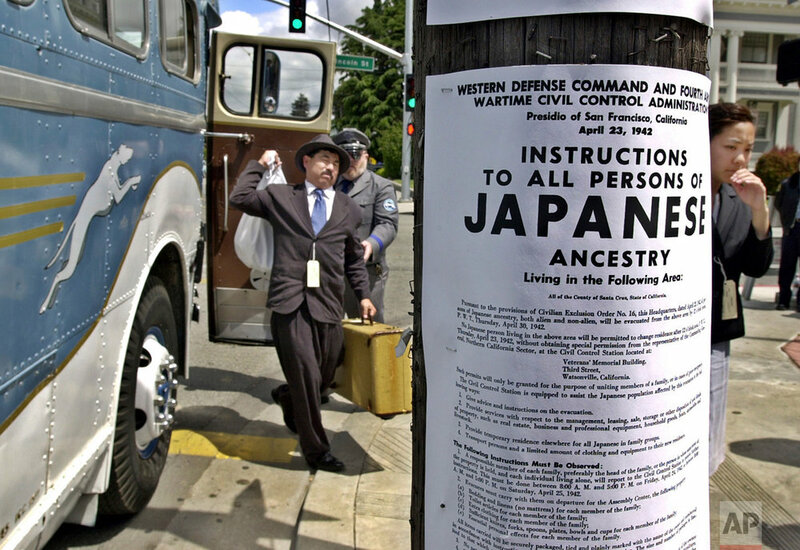 Orders against Japanese-Americans were revoked after the war ended in 1945. They returned to hostility and discrimination in finding work or places to live. A congressional commission formed in 1980 blamed the incarceration on "race prejudice, war hysteria and a failure of political leadership." In 1988, President Ronald Reagan signed a bill to compensate every survivor with a tax-free check for $20,000 and a formal apology from the U.S. government. Ina said that only then did her mother, Shizuko, feel she got her face back, her dignity returned. By then her father, Itaru, had died. "This is a burden we've been carrying, and if we can make that burden into something meaningful that could help and protect other people, then it becomes not so much an obligation but more as a responsibility," Ina said. After Trump's election, Ina vowed to reach out to the Muslim community and protest and tell everyone about what happened to her family. She brought her message to a gathering of camp survivors in the Los Angeles area. "And this old woman, she had a cane, she said, 'OK. I'm going to tell everybody about what happened. This is very bad. It's happening again,'" she said. "It's that kind of spirit." Text from the AP news story, Executive order that incarcerated Japanese Americans is 75, by Janie Har.